Almost half way through my US trip - it must be time to do a blog. The problem is that I have to find the time to do that, so I am up a little early this morning to get this done and posted. 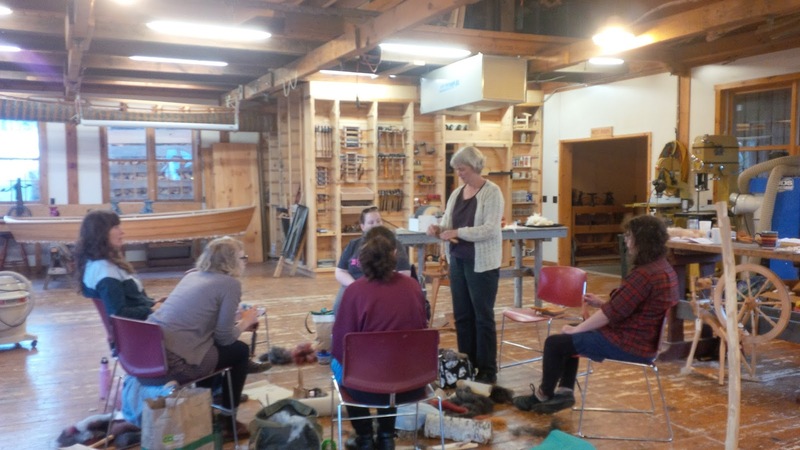 Most of this trip is working with my friend, Martha Owen, spinner, knitter, dyer, storyteller, banjo player and Resident Artist at the John C Campbell folk school where we started with 2 classes, dyeing, spinning and knitting. Class results at John C Campbell Folk School. Yarn spun and knitted from fleece dyes in the class. Colours taken from a thunder storm. Martha found a few dogs to play with on our day off between classes. 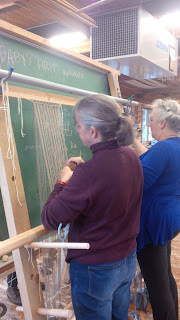 Then on to the North House Folkschool for more dyeing, spinning and weaving. 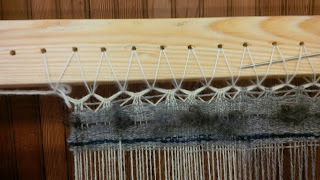 Results of the dyeing class at Noth House Folk School. Martha's spinning class at North House. 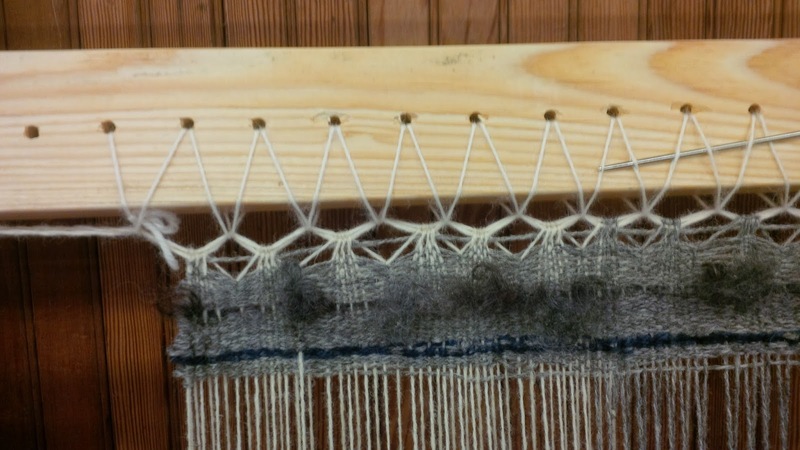 Heddles being knitted on the loom. 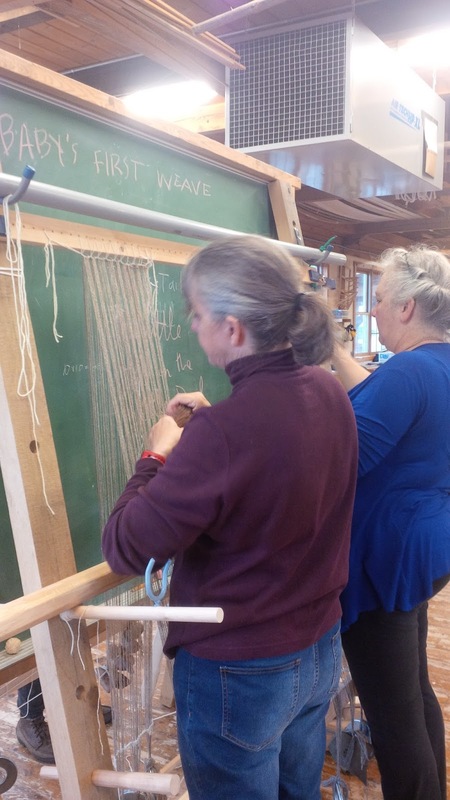 Heidi's weaving on the loom. ... and we are now at the Vesterheim Museum, just finished a dye class, and today we start a knitting class. Some of the colour we dyed at the Vesterheim Museum. Hoping for a little cooler temperatures today and no thunder storms like last nights. Lovely to read this, we are on the way to Harris and the first internet connection we have had for a time!! Continue to enjoy yourself. Thanks, Janet. We are having a great trip. I hope you both enjoy your trip to Harris too.